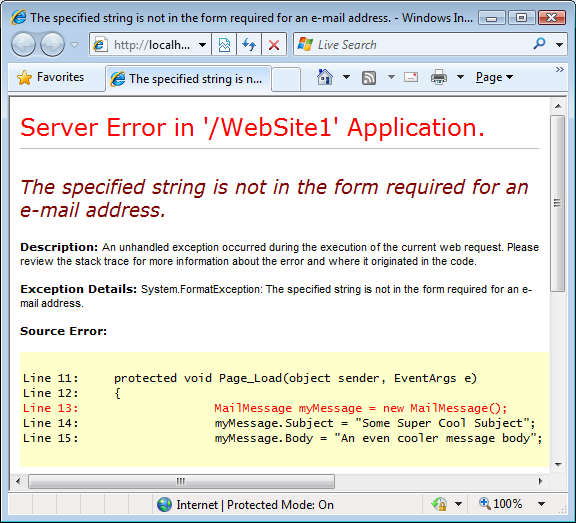 How to handle the error "The specified string is not in the form required for an e-mail address." Recently I saw a number of people (a colleague and some readers of my book Beginning ASP.NET 3.5 in C# and VB) run into an ASP.NET error indicating that the "specified string is not in the form required for an e-mail address". This error is quite common and usually pops up when developers or end users are supplying a value that doesn't match the syntax rules for an e-mail address. However, in the recent cases I saw this error popped up at the moment a new MailMessage class is constructed. That means the code crashed even before it tried to assign an e-mail address to one of the To, CC, Bcc or From properties through code. So what happened? As you can see in Figure 1 the code crashes on the line with the constructor. At this point, you haven't even had the chance to assign an e-mail address; let alone an invalid one. So what's the deal here? Here you can see that the code uses the (internal and static) MailConfiguration property of the SmtpClient class that in turn provides access to the From name and address. This name and address value is then passed into the constructor of the MailAddress class which performs the actual validation using its private ParseValue method. Its important to comment that this problem can could have happened when "TO" atribute contains the (;) caracter.. that means, if you want to send the mail message to multiples mail adress you need to use the (,) caracter. Good article, it pointed me in the right direction. Would you be kind and post the code to the send event, I know its outside your discussion, but it look like you already have a working example that I can use. I don't understand what you mean with "the code to the send event".